You might have heard the advice given above a million times. But the reality is that no one can guarantee natural backlinks even if you write an epic blog post since people always love to link to authority websites. So chances are less for you to earn links if your site is comparatively new and miles away from being an authority itself. Niche bloggers who don’t like to reveal their identity can relate to this as no one likes to put a link, pointing to an unknown site. So what’s the best way to get backlinks? Here in this article, you are going to read the same. Yeah, the subhead says it all. If you don’t earn backlinks, just bargain over it. You can use this article as a cheat sheet to buying authority backlinks. Before getting deep into the sites from which you can buy backlinks, I would like to invite your attention to a couple of things. In case you are a newbie, exploring the whole blogging thing, you might wonder why on the earth one should invest on backlinks. The following points are the answers for those you think like that. If you manage to get a backlink from an authoritative blog with tons of daily hits, you can easily get a small fraction (at least hundreds) of it to visit yours. And, you can convert a good percentage of them into your regular readers by the value you provide through your site. Eventually, you can generate leads sell stuff to them as well. Mark it, not all backlinks count, just the authority ones. As I told you, in the beginning, Google (not only Google though) considers the number of authority backlinks as one of the pivotal criteria to rank a website. As every search engine strives to provide value to the visitors, an authority backlink silently proclaims that the target site is reliable. You know what? The trust factor has a lot to do with search engine optimization (I suppose you already know the influence of user behavior in SEO). Moreover, a backlink can pass link juice of the source site to yours. That’s why all the experienced marketers tell you to disavow links from low-quality websites right away as it can pass the filthy link juice to your blog and ruin its credibility before search engines. In fact, authority backlinks can push your site up in search engine rank pages. Have you ever faced difficulties in indexing your new posts? Maybe, it is due to the lack of quality backlinks. We all know that authority blogs publish posts on a regular basis, and Google crawlers continuously go through them. Believe it or not, the personal branding era is going on in the blogging arena! The time had changed when people used to buy things online from a complete stranger. Now, you need to earn their trust in order to get them purchase the products you promote. The backlinks from big authority sites announce that your site is worth visiting. So their regular visitors got to know you are a reliable guy which, in term results in revenue growth. Now that you got an idea of substantial benefits of HQ links, it’s time to read the key points to remember while buying backlinks. I know you have made your mind for buying backlinks. But it’s not a piece of cake as you need to consider a lot of things like where to buy backlinks, whether the links has got the potential to lift you up on SERPs etc. Here in this section, I am giving you some important things to do when you buy backlinks. As you are going to BUY quality backlinks, it is obvious that you must shed some bucks. So the very first thing should be the determination of the budget. It depends on the project you work on as spending $1000 on a site that seldom has a $100 earning potential is not a good idea. At first, analyze the earning potential of your blog. And, there is nothing wrong in spending a month’s income (from your calculation) for the link building. Advice for Novice Bloggers: – Never ever calculate your monthly earning because chances are it will go wrong and take your investment away. So better spend $20- $25 at first to see how it works. You are free to spend more if it returns positive results. Even a hundred links from blogs of low metrics can’t match with a quality backlink from an authority site. Hence, you must always go through the site measures, not the backlink count. In search engines’ eyes, edu and gov backlinks are most reliable. And, it can boost your ranking better than any other link. Try to buy backlinks online from edu and gov sites to increase the trust level of your website. Google hates excessive backlinks from the same sources that it will sue you for doing the same. The truth is it’s hard to hide links from Google’s hawk eyes. That’s why I highly recommend not getting too many links from one site. You must diversify your link profile with multiple sources instead of making it garbage with tons of same websites. You might have been making a mistake of building all of the links to your homepage. NEVER do that again. Most of the blogs have the latest articles’ archive as their new page that isn’t relevant backlink in a piece of content. And, it will make Google think that you are doing something illegitimate. So, from the next time you buy SEO backlinks, make sure that it points to one of the inner pages of your blog. It’s true that we build backlinks to convince search engines, not the audience. But, you must always go for niche relevant backlinks, especially if it points to your money site. Google has been rolling out search algorithms regularly to get rid of spammers from their SERPs. So, it can sense something fishy on seeing a link to ‘5 Best Keyword Researching Tools’ from an article titled ‘How not to be Overweight.’ And, it will end up in ruining all your organic traffic figures. Short term contextual or sitewide links may work out for event blogs. But if you want to build links for a long-term website, I highly recommend buying links that exist for an extended period of time (say at least a year). Why because the loss of links after a short period will harm your site badly and your dream project may disappear into oblivion. With that being said, let’s just find out the best websites to buy backlinks to your site. You are going to read the core of this post. I have tried my best to come up with all the best sites to buy backlinks. When it comes to buying links online, I prefer and recommend Links Management first. They have got tons of high PR sites under one roof to provide you with links. Linksmanagement is an entire link store with a lot of features. The most useful feature I feel is the page glance option. You can view the web pages before you order a backlink from those. It will help you find out how the source site looks like. They also got an amazing filter with which the backlink opportunities can be sorted out on the basis of price, PR or any other site metrics. In case you are a busy person with no time to look after your link building campaign, Linksmanagement will give you a dedicated SEO manager. He will keep purchasing HQ links for you. But I suggest doing it on your own as you will experience a quick demise of your funds within no time if you seek their SEO manager’s help. You can also buy edu backlinks from there after a deep research. Perhaps the best site to buy high PR backlinks (though PR is dead). The preview feature helps you have a sneak peek at the source websites before placing an order. You can buy cheap backlinks from here (expensive ones are there as well). Buying permanent, as well as temporary links, is possible here. The payment system seems like a little complicated. You need to add funds to Linksmanagement account and pay from there instead of individual backlinks. Every month they withdraw at least $15 (not to allow link contracts to expire) from your account, and you can’t turn it off from their site (It only takes an email to them, though). 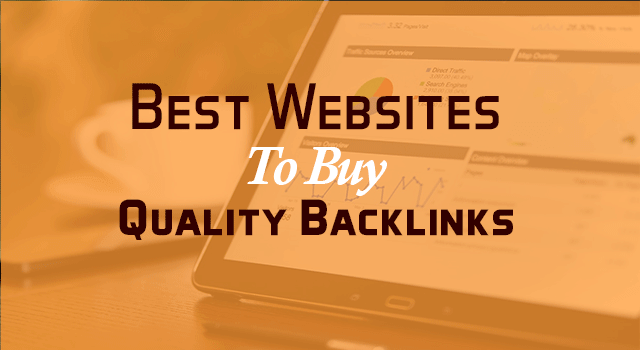 I think the most given answer for where to buy backlinks and how to buy quality backlinks are one; that’s backlinks.com. Being one of the prominent sites to buy links, Backlinks.com has helped a lot to achieve their dreams via blogging. They possess an impressive feature of replacing bad links with good one. In case you already paid for a link and you got a bad link in return, the backlinks.com team will resolve the issue by just replacing the same. Deserves an applause, doesn’t it? Backlinks.com team has prepared a link directory with all the web pages they have. You can search there to get a site with required measures to buy a backlink from. Another interesting feature is that it is possible to earn some decent bucks from this amazing buy-sell platform. You only needs a good website and should have the willingness to place links. If you are craving out for more money, just keep calm and join their affiliate program. As the number of your referrals grows, you will get paid no matter what. A campaign wizard is present to ease the process of link building. If you prefer taking the effort out from your shoulder, you will have to make use of their automation facility. In case you happen to have a bad link from their platform, it will be replaced with a high-quality link soon. Your willingness to put backlinks on your blog can fetch you a handful of money from backlinks.com. And, that double up if you use the affiliate program as well. They have no feature to buy permanent backlinks. So, a fixed monthly fee should be paid to sustain each link. I hope you already heard about Blackhat World at least once. It is more of a forum for those who want to bang the web using the blackhat strategies. But that doesn’t mean this site is not going to help you. Just visit once and you will get to know how awesomely forum members share their working strategies. Very often, some members post threads about selling backlinks. They announce that you can buy high PR cheap backlinks. But you should remember the fact that BW is not a site dedicated to buying backlinks. So, it would take some time to find the right forum threads. I am sure that you know the negative impact of a filthy backlink in organic traffic. So, you must research more about the seller before buying even a single link. You can buy some really cheap high-quality backlinks. It is possible to interact with the sellers to get more about him and the gig. Blackhat World doesn’t want us to settle the contract within the community. You can communicate on some other platforms and close the deal. You will be in big trouble if you don’t research well about the seller. Tons of low quality backlink gigs are there that seem to be legitimate. You know that term, don’t you? Whenever you hear something with blackhat in it, your mind automatically estimates a chaos. Let me tell you one thing now. You have been doing blackhat SEO right from the beginning of your career. Yeah, you heard it right! Wondering how? Well, Google hasn’t told us to build backlinks even if through the so-called whitehat way, be it single link you get via a legitimate comment. So everyone who builds links (consciously or unconsciously) are doing blackhat SEO. So, I don’t think anything wrong with their site name. If you are a person who wants to buy cheap backlinks, Blackhatlinks should be your pick. They are not into providing site-wide or contextual backlinks. But what they provide for very reasonable prices will make you spell bound. Very cheap backlinks that you can buy a hundred of them for even $6. You will get the links within 24 hours no matter what the volume is. The link building is fully automated. So, 100% quality may be at stake. You can’t buy high quality links from sites with custom domains. They only provide bulk link building service that you will not be able to buy 10 or 20 of them. If you are a person who wants to buy backlinks to your site from authority sites, you should not sign up for Blackhatlinks as they won’t give you the service you need. I would recommend Linksmanagement to buy authority backlinks. But the problem is you can’t purchase web 2.0 links from there. I was really exhausted after searching for a site that sells both authority and web 2.0 backlinks. But I did it. Guess what? I found a site on which you can buy both the type of links. PostLinks.com is that site. You need to sign up for their any of the three membership plans to buy high quality backlinks. Unlike Linksmanagement, PostLinks doesn’t allow you to pay for each backlink as it works on a credit system. They calculate the link price on the basis of Moz’s Domain Authority. The greater the DA, the higher the price will be. Provides both authority and web 2.0 backlinks so that, you won’t have to visit two sites for both types of links. They only give you HQ backlinks from old websites with good authority. It is impossible to pay for a single link. Though you can purchase a single link, the payment for the membership plan needs to be paid in advance. The basic plan costs you $49, which seems to be expensive for people looking for 3-5 links. Pricing pattern may sometime make no sense as it is possible for low-quality sites (read low-quality link profile) to have good DA. SEOclerks is the one-stop place for anyone looking to buy an SEO service, be it backlinks, social signals or on-page optimization. So, you must understand the fact that this one is not a dedicated platform for backlinks only. Chances are you can find quality backlinks services on the homepage itself even if you are not signed in or up. As a cherry on the cake, the brilliant filter system allows you to classify the popular gigs on backlinks category. Due to a large number of service providers, it may be a confusing task to choose which one to go with. The ‘love’ count will be going to help you get rid of the confusion. The filter allows you to sort the gigs based on the price too. In this way, you can find backlink gigs that won’t rip off your pocket. If you are good at an SEO service, you can earn some quick bucks selling your expertise here as well. Backlink services for almost every budget are available. It is easy to find the reliability of a seller by referring to the ratings and reviews. You don’t have to use another platform for your SEO needs if you choose to go with SEOclerks. Sometimes, the searching process may become tedious to find gigs with the right price and good reputation. I am going to kill you if you say Fiverr is new for you. Just kidding! Fiverr is one of the popular if not the best freelancing platform that has earned a lot of trust from the service sellers and buyers. As the name suggests, the price for gigs starts at $5. Though there are services with cost more than $5, the popular price choice is five. Do you want to buy cheap quality backlinks? I recommend giving Fiverr a shot. You must analyze the reviews and rating of the seller before placing an order because link building is the most sensitive thing in digital marketing. And I don’t think it’s a good idea to purchase from newbie service providers. Tons of quality link builders are there on Fiverr, and you don’t have to spend lots of money to purchase their service. Just like in SEOclerks, Fiverr also got an efficient filter to help you find gigs that meets your requirements and budget. Filthy backlinks may ruin your entire business if you don’t choose sellers carefully as there are some low-quality link providers. Do you know how to buy links now? I have given you all the guidelines and seven useful websites to buy backlinks. So I hope I resolved your question; where to buy backlinks, didn’t I? In case you are left with any doubt, feel free to ask via the comment section down below. I iterate, choose sellers carefully, and select services wisely. You mind hitting one of those share buttons? Interesting and Useful write up. Apart from this list, sometime i use truelancer to build backlinks for my clients. But i won’t prefer truelancer for others. Then i don’t want to say the pros of truelancer here. The websites you listed here are very useful to build backlinks who don’t have enough time to build backlinks. Awesome post. The first time I heard about PostLinks. They said it’s a Link Building Software. How It works? Is that harm our SEO? Is buying backlinks good for the long run? I am back here after a long time as well.By the way nice post for those who can invest money on building backlinks. Great Article Jyoti, back-links such a backbone for any kind of website. I have started a few niche sites but didn’t find time to build links to them. May be these paid links do some help. Thanks for sharing such a useful links where we can buy the backlinks. Nice advice before going to buy links from anyone. Yes, I not only have heard about blackhatworld, I started my profession as an internet marketer from blackhatworld. I learned everything from these two forums, blackhatworld and warriorforum. The BHW marketplace is the best place to buy or sell links. And many of the guys whom I know from BHW are making a smart income from this link business. Buying backlinks is always necessary for a newcomer (if he has funds). because noone links to an unauthority site and you said that right. Thanks for sharing the amazing link. I did not know about many of these marketplaces. Thanks for sharing these websites to buy high quality backlinks. I was looking for some high quality backlink selling websites from where I can get some good quality backlinks for my niche sites. I will probably check out these sites to get backlinks for my niche sites. Backlinks plays a fundamental role to improve the search ranking of any website or blog. Relevant backlinks with authority sites are very useful in this scenario. You have shared some great resources to buy high quality backlinks. Buying links is still a worth while part of any SEO campaign, but you have to know what you are doing overall so as not to get any kind of penalty from Google. You should have a diverse link profile setup using different anchor texts to lots of pages on your site. Only have a small percent of keyword rich links point back to you. Make sure all your links come from niche relevant sites and that you build your links evenly over time. I bought backlinks form seoclerks from 1 selller. And I think he delevered best backlinks serivce under budget. You can get 100 backlinks in which he delverred 10 types of backlinks like web 2.0 , premium social bookmarking,video sites including youtube and vimeo,image submit sites like imgur,pinterest and we heart it etc. let me check other sources you have shared here. Thanks for sharing the knowledge. Building backlinks is a tedious process for everyone. Although I’ve never bought any link in my career but after reading this post it seems that if you are a newbie in the blogosphere then we should invest some money in buying backlinks.